The hotel has a buffet style breakfast each morning for an additional fee to the room. Ganesh's company paid for him to have it, but it would be too expensive for both of us to go. He wants me to have a nutritious and filling breakfast so he lets me have the buffet and he goes to Starbucks. Everyday, including yesterday, I get to completely stuff myself so that I feel like I don't have to eat for many more hours. There is even a fry-cook guy that you can ask to make you stuff and point to the ingredients you want. Twice I have asked for a mushroom and ham omelette, to go along with my bacon, sausage, fruit bowl, smoothie, toast, and yogurt. The yogurt is definitely meant to please all the Scandinavians and other general europeans because it has many optional toppings such as granola, mixed dried fruit, toasted coconut, and other stuff. I have discovered that such "Muesli" is amazing, and everyday I have a bowl of half-plain half-strawberry yogurt, generously topped with granola, dried fruits, and oats, and that goes along with my omelette-bacon-sausage-toast-smoothie-fruit-bowl combo quite nicely. They have little smoothies in shot glasses and the raspberry-blueberry-lindseed smoothie is out of this world. I shamelessly take 3 and 4 shot glasses and run like a bandit with my bounty. They have a selection of nice breads, even the super dark chewy kinds, and then a cool toaster where your toast slides on a conveyor belt through an oven and falls out the other side when it's done. They have fancy machines that make espressos, cappuccinos, lattes, and the like. But what if you want a regular cup of coffee? You have to stop a waiter person and ask for it. But what if you don't want to talk to people? I'm sure all of you fellow hermits are asking. Well, I have the answer, and it might even result in better coffee. I just use the machine to make myself an Americano. I tell the machine to make me an espresso, then use the hot water spout to fill up the rest of the cup. Voila. Black coffee that tastes awesome, and you didn't have to speak to a single person to get it. 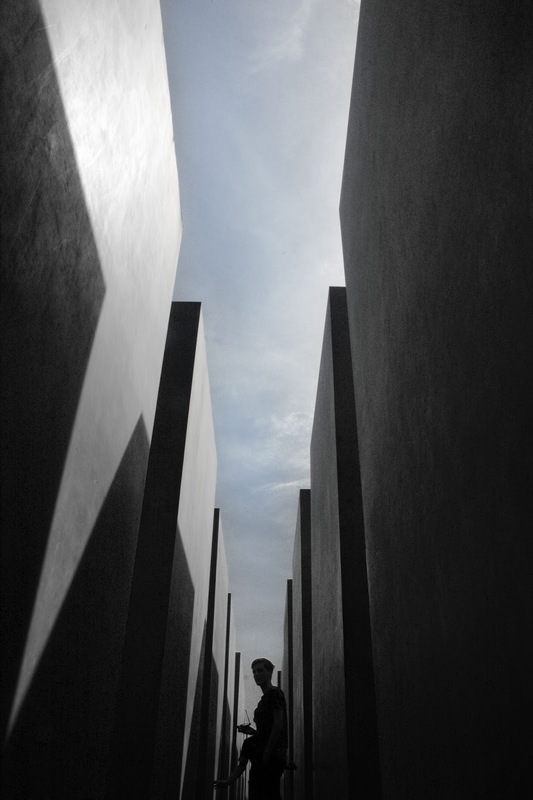 Yesterday, the Holocaust Memorial was the first stop on my agenda, which was about a 10-15 minute walk from the hotel. I had planned to be a "real" cameraman and take my time there. I brought my big camera and made my way. I had some ideas in my mind what kind of shots I wanted to make, which required some hard sunlight, which shouldn't be a problem because the sun has been baking me to death everyday. I woke up to find the sky overcast, and the air a little cooler than before. Nooo, why is the first cloudy day the day I plan to shoot the memorial? But I went anyway. 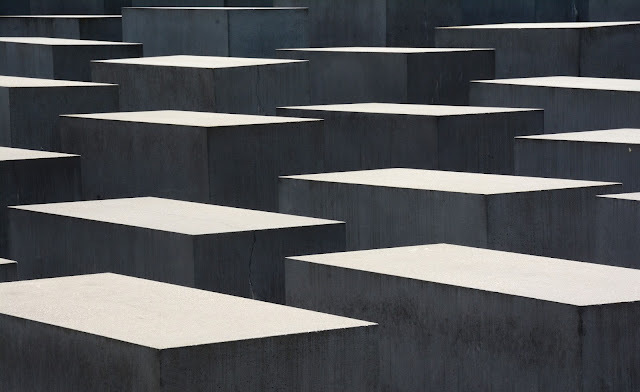 The memorial is made of 2711 giant cement blocks positioned in an area probably the size of several football fields and arranged in a grid pattern. The ground gently slopes up and down with little hills and valleys, generally in a bowl shape getting deeper as you walk into it and shallower as you walk toward the edges. At the deepest point the cement blocks are probably 12 or 15 feet tall. They are not all the same height but vary slightly which makes for interesting jagged patterns. I knew I was not going to be able to make the best shots unless the sun came out so I did the only thing I could think of. "Hey spirit guides, or whoever has control over the weather, I need the sun to come out right now so I can make better photos," I said out loud to myself as I walked through the memorial, you know, full crazy-person style. But five minutes later the sun came beaming through and hard light was abound. It was great. So then I set myself up on the outskirts of the memorial, finding the perfect stage for something to happen in. I set my bag on top of one of the cement blocks that was at my standing level and placed my camera on top of the bag and then just stared through the viewfinder, focused and ready. Like a sniper. I stayed there for quite some time, maybe a half hour. 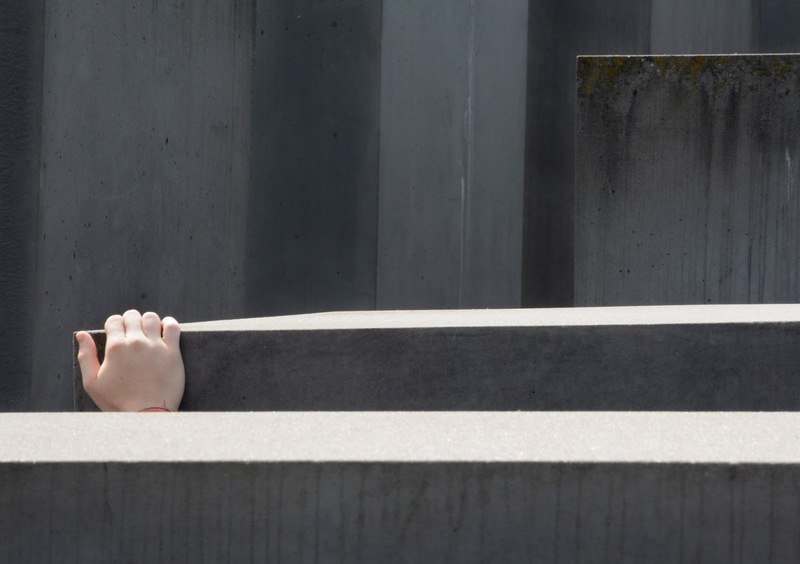 I decided to go into the depths of the memorial and find some spot in there and repeat. I sat on the floor leaning against a cement block pointed in a direction that was interesting and sat there staring through the viewfinder with my finger on the button waiting for something interesting to happen and stayed there for half hour. I then had an idea that wouldn't it be cool if I could get a bicycle riding by and captured right in the moment where they appeared between the cement blocks, so I walked around again looking for a slot of street between cement blocks that had no cars and would show the complete bicycle and I sat there for a half hour trying to click the shutter any time something moved. It was a lot of work and I stayed at the memorial for about 2 hours. Don't be fooled by my photos, it looks like I was all alone at some obscure hour of the day at the memorial, but really there were hundreds of people carelessly frolicking around. I wouldn't have minded if they looked more artistic, or even just acted more serious, but they were all just crappy tourists, like me. There were a lot of other folks with cameras, but I could immediately tell how serious they were just from how long they were willing to stay in a spot. Then I went to a few souvenir shops on my way back to the hotel and by the time I got back, it was cloudy again. It really did open up just for me. I made my way to the Natural history museum so that I could see real live dinosaurs. It was about a 30 minute walk from the hotel I spent a bit of time there looking at the wide variety of taxidermy animals they had. One of my favorite areas was the exotic birds. So many gorgeous birds in the world. And of course the giant dinosaur skeletons were pretty amazing. So what the weather-spirits didn't tell me was that my sunny weather request earlier came with cost. When I left the dinosaurs, it was raining. I knew I had a 30 minute walk ahead of me, so I had this general feeling of "Om" and acceptance to the fact that I will be wet. Good thing my camera bag is water resistant. Everyone around me looked miserable, squinting their eyes, rounding their shoulders, holding objects above their heads, scuttling from overhang to overhang trying to avoid getting wet. But me? Nope. I just walked in the rain. But even my Om was challenged as the rain started getting progressively heavier. Not enough? cue the wind. She's still not phased, captain, cue thunder and lighting. Yes. The last 10-15 minutes of my walk was thundering, and the rain was pouring down. I still remained neutral and passerby's were actually chuckling at my demeanor. By the time I arrived back at the hotel, I was totally soaked. My wet hair drooped and my shirt soaked. Ganesh was bummed because he wanted to go out to see the "East Side Gallery" a strip of the Berlin Wall that has been decorated with art for about 1300 meters, they say. All the art celebrates the falling of the wall. We really wanted to see it, but it was raining. But we took a nap and when we woke up it was not raining anymore so we got to see it! I really enjoyed a lot of the work. Some of it was dark and disturbing, and some was light and humorous, it was really cool. Ganesh with wall cross section.